After working an exhausting shift in a professional kitchen, what does a renowned chef like Steven Brochu of Beaumont's Chartier cook for dinner at home? CBC wanted to know what Edmonton's best chefs whip up when they're short on time or just don't have the energy to create their usual fare. In Fast Food, we'll be highlighting local chefs from their own kitchens, sharing their go-to recipes. Chef Steven Brochu spends his days creating and serving his elevated versions of classic French Canadian cuisine at Chartier, the culinary pride and joy of Beaumont, Alta. So, after working an exhausting shift in a professional kitchen, what does a renowned chef like Brochu cook for dinner at home? It turns out his partner, Lourdes Brochu, gets credit for a lot of the home menu planning. "I take most of my cues from what my wife wants, which is usually pasta," says Brochu, proving that chefs are indeed pretty smart folks. 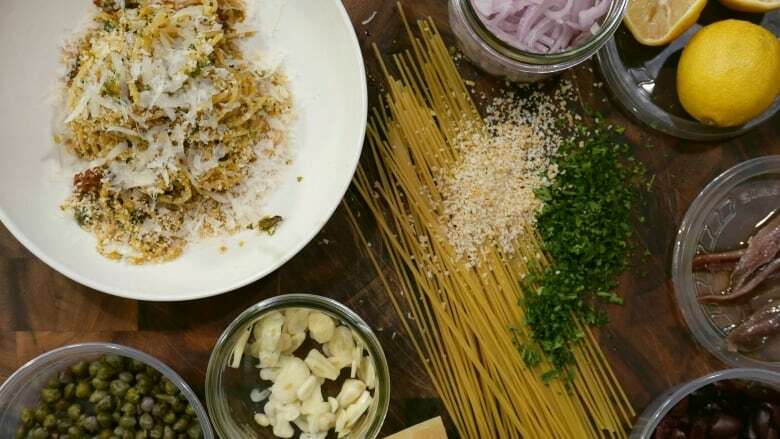 "She loves aglio e olio [simple spaghetti tossed with sautéed garlic and olive oil and often chili flakes] and cacio e pepe [pasta with black pepper and pecorino romano] as well as pasta puttanesca," for which the recipe follows. 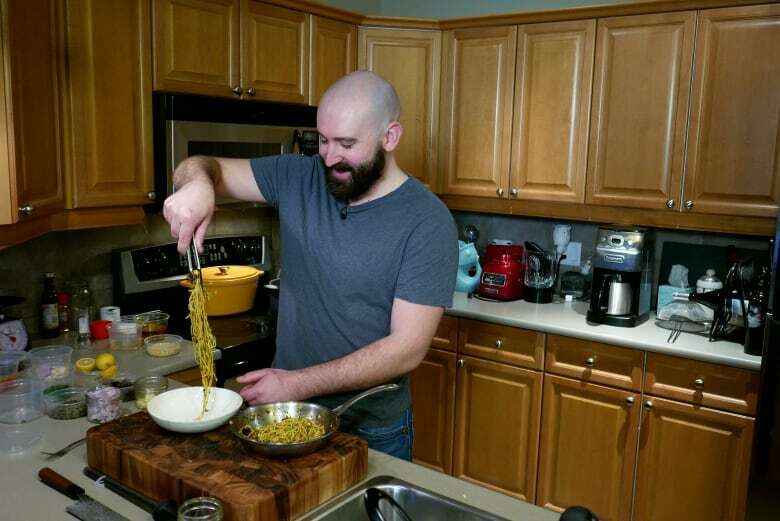 You would think after cooking all day at work, cooking at home would be the furthest thing from his mind, but Brochu says home cooking is different. "It's nice to cook with, and for, loved ones, with no time pressure. Also a glass of wine helps," he says, making another astute observation. He also takes inspiration from the Brochu family pizza and movie nights of his youth, which featured dad treating the family to scratch-made pizzas. The chef cautions, though, that being a professional doesn't mean you can't enjoy some of life's guilty pleasures once in a while. "I grew up making myself Kraft Dinner, and I still love it. I use all butter, no milk, and maybe a bit of Valentina hot sauce." Brochu says this puttanesca is a meal he makes at least once a week. He promises it can all be done in under 12 minutes. Cut the rind off your Parmesan and add it to the pasta cooking water for extra flavour. Add some of the reserved pasta water to the pan before serving to make the dish more silky and saucy. For a quick weeknight dinner, precook the pasta and toss with olive oil. The next day you can just add it to the pan with the sautéed ingredients. Toss pasta in olive oil so it doesn't stick to itself. Store until it is needed. Sauté garlic and shallots, then add chilli flakes and black pepper. Add capers, anchovy and olives. Add parsley — the herb should sizzle a bit in the oil. Add the halved cherry tomatoes. Cook until the tomatoes begin to break down. Add a splash of white wine and cook for a minute. Then add cooked pasta to pan, adding a splash of pasta water. Squirt half a lemon into the pasta and toss to cover the noodles in sauce. Move pasta to a plate. Garnish with toasted panko bread crumbs and grated Parmesan. 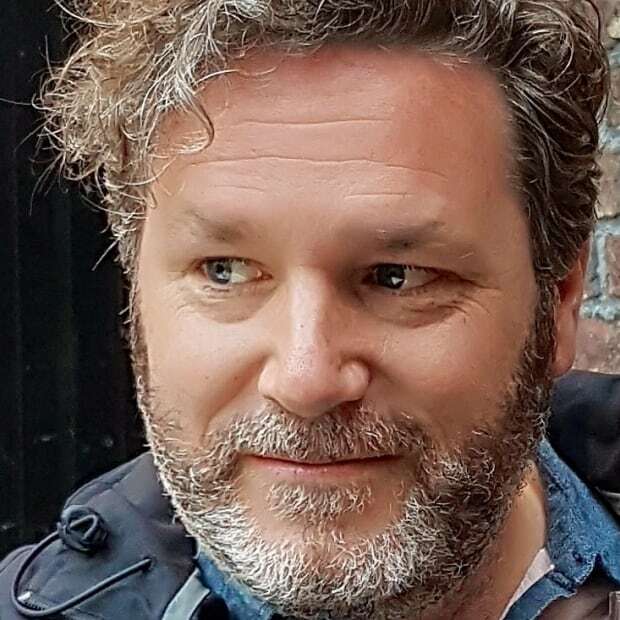 Phil Wilson is a food writer, podcast host and regular contributor to CBC. He has a never-ending passion for food, which he shares on his website, baconhound.com, and in magazines, on radio and TV, and CBC Edmonton's annual best restaurants list.